This painting shows a range of ages and both sexes in the company's coats. 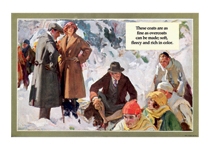 This painting shows a range of ages and both sexes in the company's coats. This was a good way to make the would-be buyer feel that his or her social success would be enhanced by a Hart Schaffner & Marx coat.